MetPak professional weather station is an all-in-one weather system capable of monitoring up to six weather parameters: barometric pressure, air temperature, humidity, dew point, wind speed and wind direction. 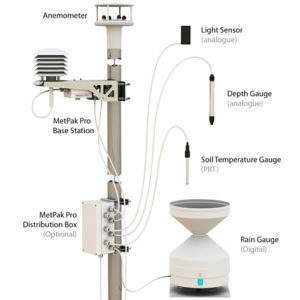 The MetPak weather station has a variety of wind sensor options that can be mounted remotely from the weather station. MetPak RG professional weather station is capable of monitoring seven weather parameters: precipitation, barometric pressure, air temperature, humidity, dew point, wind speed and wind direction. The weather station has a rain gauge input and can be supplied with the Gill tipping bucket rain gauge if required. The MetPak RG weather station has a variety of wind sensor options that can be mounted remotely from the weather station. 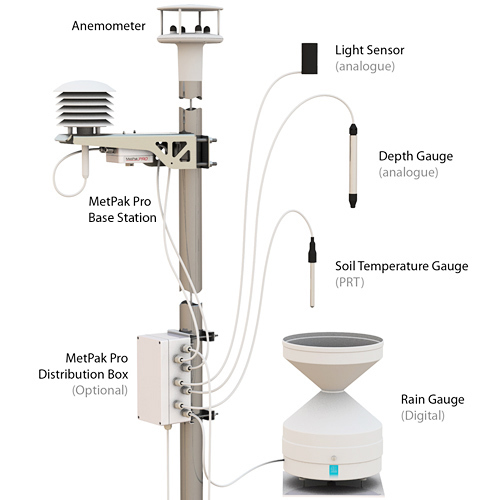 MetPak Pro professional weather station is an all-in-one weather system capable of monitoring the same seven weather parameters as MetPak RG, with additional inputs for an Pt100 temperature sensor and two analogue sensors (water level sensor, pyranometer, pressure sensor, soil temperature sensor etc). External sensors can be connected directly to the weather station via an optional junction box. MetPak Pro has a variety of remote-mount wind sensor options.